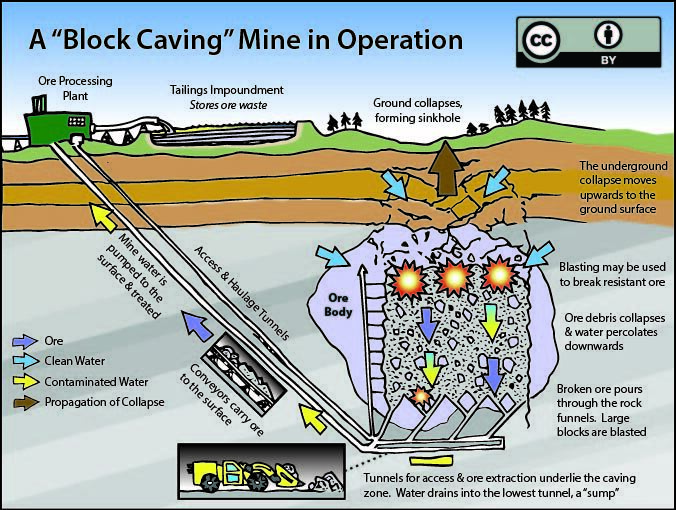 In block caving, a large section of rock is undercut, creating an artificial cavern that fills with its own rubble as it collapse. This broken ore falls into a pre-constructed series of funnels and access tunnels underneath the broken ore mass. These mineworks are sheltered from the collapsing ore inside bunker-like mass rock, and miners extract it continuously from here. The collapse progresses upward through the ore body, eventually causing large areas of the surface to subside into sinkholes. Fairly low mining cost (least of undergorund method). 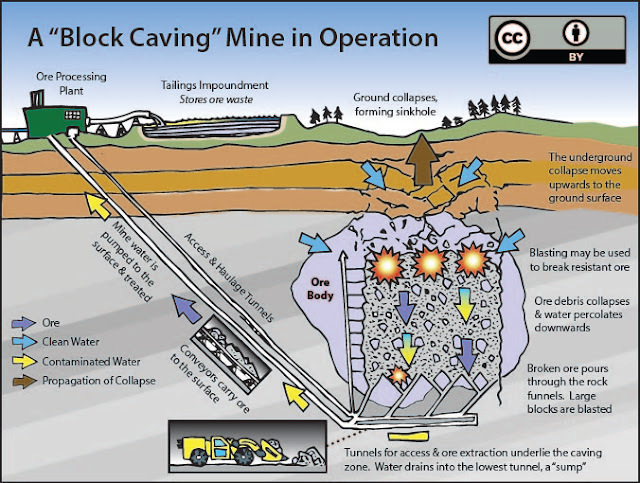 No drilling and blasting cost as rock breaks entirely by caving. Highest production rate of underground methods. Good health and safety for miners. Caving and subsidence occur on large scale. Great damage to the surface structure. Maintenance of opening in production areas is substantial and costly if pillars load excessively. Method's success largely depends on draw control. Chances of spontaneous combustion in ore or rock during caving if drawing slow or delayed. Hazardous workdue to hang-ups in grizzly and slusher sublevels and at drawpoints, with some risk of air blast throughout mine.